A stress fracture results from abnormal loading or inadequate recovery time following repeated loadings on bony structures. Stress fractures occur after an increase in frequency, duration, or intensity of exercise creating imbalance between bone resorption and formation, most frequently affecting athletes and young people. Both intrinsic and extrinsic risk factors have been established. An estimated 90% of stress fractures in athletes and footballers affect the lower limb, with the tibia being the second most frequent injury site followed by the pelvis. Clinical history and physical examination are critical for early diagnosis and optimal treatment. Plain radiographs have low sensitivity and are often inadequate to detect this condition. The most frequent imaging exam is currently MRI, which has good sensitivity and specificity. Conservative treatment is an appropriate and effective treatment in most cases. High-risk fractures (e.g., involving high tension sites or hypovascular zones) often require surgical treatment to facilitate healing and reduce risk of refracture. Location of the fracture, characteristics of the fracture and the athlete, and the level of competition must be taken into account during treatment decision-making. 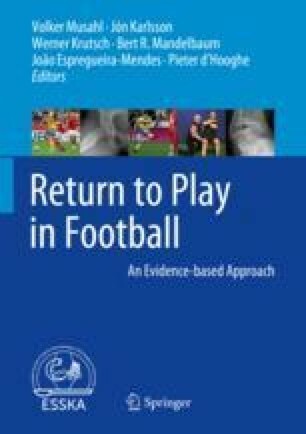 There are no perfect imaging techniques nor clear clinical evidence-based guidelines concerning return to play. However, as a “golden rule,” the athlete should be symptom-free for 2–3 weeks before returning to the pitch. The fact that lower extremity stress fractures are relatively rare conditions creates increased difficulty in determining the effectiveness of treatments, particularly newer treatment options. This chapter provides a comprehensive management approach to stress fractures of the lower limb, with the exception of foot and ankle stress fractures, including the most updated information concerning optimal treatment and return to play.